Seventy-five new students, with 6 upperclassmen volunteers and 3 staff members, gave over 240 hours of community service on August 29. The Science, Technology & Society program (STS) is sponsored by the College of Engineering as part of the family of selective College Park Scholars living-learning programs. Each year, College Park Scholars sponsors an annual Service Day to show freshmen how to be engaged students in the broader community. Sophomores return for Service Day each year to support the freshmen and lead them in work. This year STS was fortunate to have 6 peer mentors serve in this role: Michael Y. Wang (Comp Engin), E.J. Lum (Comp Sci), Jessica Riddell (Math), Gabi Rovegno (Env Studies), Kevin Owens (Comp Sci), and Jed Nieves (LTSC). We returned to sites where STS had performed service for Service Day 2010 and for the Office of Leadership and Community Service Learning's Terp Service Days. Students worked outside to restore a historic landscape in Takoma Park and to refurbish and expand two community gardens in Edmonston and Riverdale, PG County. Our off-campus partners for Service Day 2011 were the City of Takoma Park, ECO City Farm (Edmonston), and University of Maryland Extension (Riverdale) through the university's Center for Educational Partnership. You will find more photos at STS Service Day 2011. 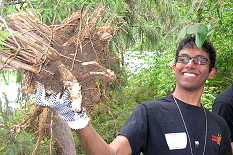 Students mulched new paths, hauled compost to create a new garden site, turned compost, removed saplings, vines and stumps of invasive species, and removed debris from Hurricane Irene. They learned about technologies that make small-scale farming highly productive. The Scholars STS program awards credit to students for pursuing service. Look for STS volunteers at Maryland Robotics Day, Fischell Bioengineering Day, Maryland Day, the USA Science and Engineering Festival, and other fascinating events. Sophomores may earn credit for volunteering in after school robotics clubs for children in PG County. I want to continue doing this kind of physical service.